This Carbon Monoxide Detector with Battery Backup is a hard-wired carbon monoxide combo alarm with battery backup. It features a CO sensor, Intelligent Sensing Technology for fewer unwanted alarms, an 85dB horn, 9V battery backup, side-load battery drawer, two silence features and is interconnectable with up to 18 devices. Applications include residential and institutional applications including hospitals, hotels, motels, dormitories and other multi-family dwellings. The "Intelligent Sensing Technology" system is designed to reduce nuisance alarms. The "Latching Alarm Indication" remembers which unit initiated an alarm. When interconnected, the unit that triggered the alarm rapidly flashes its red LED indicator. After the alarm condition subsides, the initiating unit will store in memory or "latch" the information and begin to flash the red LED indicator once every 5 seconds. The "Smart Interconnect" feature allows the unit to be interconnected to other BRK CO and smoke alarms. If there is a smoke event, the interconnected CO5120BN horn pattern will emit the same sound as a smoke alarm (3 beeps, pause, 3 beeps, pause). 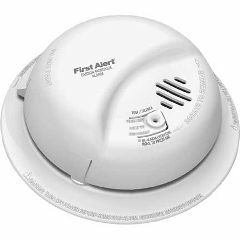 If there is a CO event, the interconnected CO alarms will sound with their normal horn pattern. Battery installation and removal can occur while the unit is mounted via the side load battery compartment.